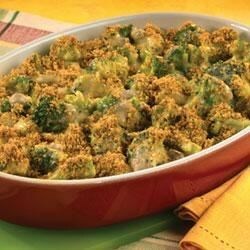 "Serve this creamy broccoli and cheese casserole as a side dish or a vegetarian main course." Update the classic holiday dish with bacon, red peppers, or almonds. This was horrible. I made it yesterday for Thanksgiving and doubled the recipe. There was way to much cheese and the broccoli was tough. Good with 2 cups cooked rice mixed in. Skip the mustard. loved it. i added chicken and egg noodles to make it more filling. everyone keeps saying skip the mustard but thats where a lot of the flavor comes from. leave it in its delicious. We thought this was delicious; not to mention quick and easy to put together. I too doubled the recipe and added garlic and onion powders and black pepper and skim milk. Thank you! mmmmmmmm :) I added more cheese and used fresh broccoli and it was delicious!